Lew Bryson knows Pittsburgh liquids. 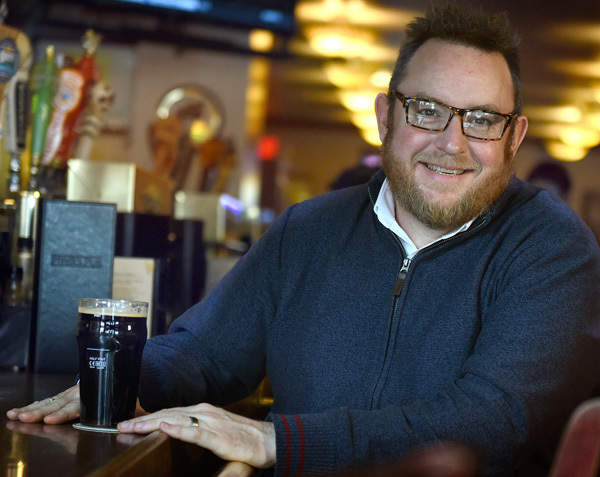 He may be a native of the Philly area, but Bryson, who splits his professional time writing about whiskey and beer, has spent a significant amount of time here, attending school at Carnegie Mellon and haunting some of our great old beer bars, like Chiodo’s Tavern in Homestead. And even though his roots remain in the eastern side of the state, Bryson is here a lot, often enough that he knows what our breweries have to offer and how they stack up against the rest of the country. And he pretty much wrote the book on tasting whiskey (no, really — he wrote the book on tasting whiskey), so he knows what our craft distillers are up to as well. 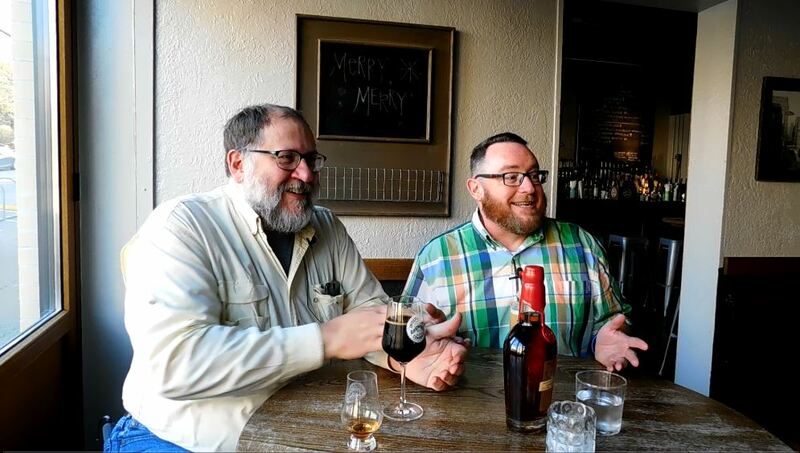 Bryson was in town recently to share pours of a treat from Marker’s Mark: a Private Select blend he worked on with a few other spirits writers who, collectively, were known as the curmudgeons (seriously — it says so right on the bottle). And while we discussed the process of picking out differently prepared barrel staves that were used to give their bourbon some heft, we also took a little time to discuss the scene in Pittsburgh and how we’re buying and consuming our beer these days. As promised in the show: find Bryson on Twitter. He’s got a few more bottles of that special Maker’s to share, so pay attention, and you might get a taste for yourself. Want to find me on the Wednesday of Pittsburgh Craft Beer Week? Don’t bother looking in the office. 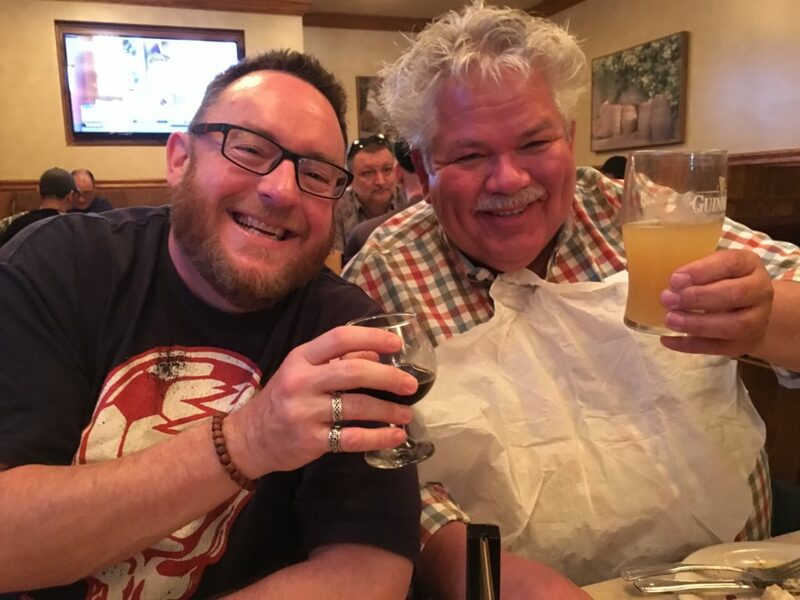 But since then, the day has featured a dual purpose: to highlight the beer acquisition skills of Hart Johnson, the cellarman at Piper’s, and the talents of Mindy Heisler, the executive chef there and at the Pub Chip Shop next door. Each year, Hart lines up some tough-to-find kegs and casks, generally of the beefy beer variety; for example, I had pours of three huge stouts with my breakfast this week, along with a glass of the ultimate breakfast beer, Roundabout’s Mimosa Gose. And then there is the food, which is excessive in all of the best ways. My breakfast: Piper’s crispy chicken tenders served over a house-made Belgian waffle, with Mindy’s jalapeno maple bacon syrup drizzled over the plate. That’s one of the lightweight dishes, too; I chose it over the Drunken Irishman, a Belgian waffle covered with warm bourbon-roasted banana slices and Nutella. And then there was the sandwich: a chicken-fried sausage patty and a dippy egg, served in a Just Good Donuts glazed doughnut bun. I am pleased to be able to tell my doctor that I didn’t even consider that one. Craft beers paired with bacon and burgers? A new stout from Helltown, brewed for the city’s biggest comics store chain? That’s more than enough to get me to brave afternoon rush-hour traffic and make the trip to Cranberry to Pig Iron Public House. 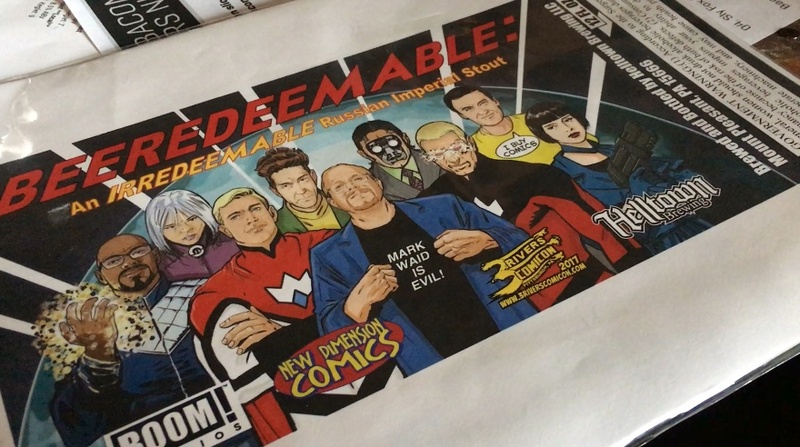 Let’s start with Beeredeemable, a bourbon barrel aged Russian imperial stout brewed by Helltown for New Dimension Comics owner Todd McDevitt. Todd’s commissioned these beers before — last year’s version was another imperial stout called Darkest Dawn — but this is the first time he’s released the beer in conjunction with Pittsburgh Craft Beer Week, instead of waiting for his annual Three Rivers Comicon in May. The beer is a beast — boozy and woody, with hints of bitter chocolate and a rich mouthfeel — and you still have several more chances to try it before Beer Week is done on Sunday. Beware, though — Todd said each location is getting just a sixtel, so it won’t last long. Event No. 2 at Pig Iron had to do with a sloppy cheeseburger and one of my favorite Pittsburgh-brewed beers. 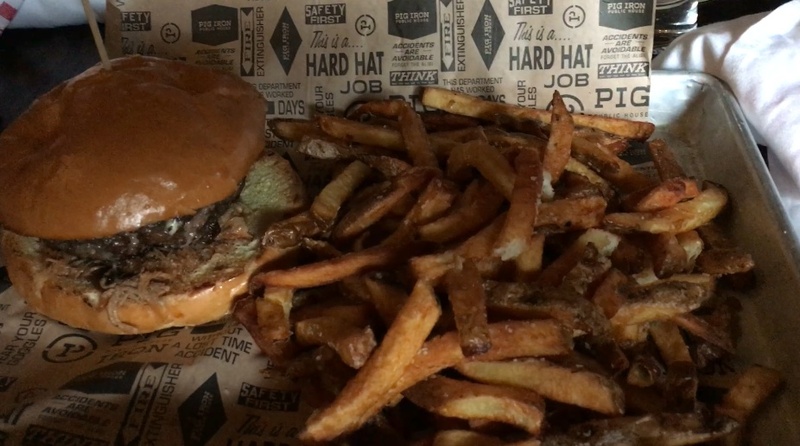 The premise was to pair specific beers with either a specially prepared flight of bacon slices or with one of the substantial burgers on the Pig Iron menu. My choice was a smoky-and-sweet Foreman burger, paired with a smooth, malty Fat Gary from East End. Did it work? Run the clip to find out. Bocktown Beer and Grill wasn’t the first craft beer bar in Pittsburgh. It was never the biggest, nor did it have the most taps. But there aren’t many other places in town that have done as much for local craft brewers, especially the guys who are just starting out. There would’t be many places that have done more to make craft beer accessible for those giving them a try for the first time. And I don’t think there is anyone who has done as much to help me get to know craft beer and the people who have built our incredible community here. Difficulties with her lease led Chris Dilla to announce the closure of the original Bocktown. But my hope is that it won’t be long before she’s back in the business in one way or another. It looks like you have through the end of the month to grab one last beer at Bocktown and give Chris your best wishes. Make sure you don’t miss that chance. 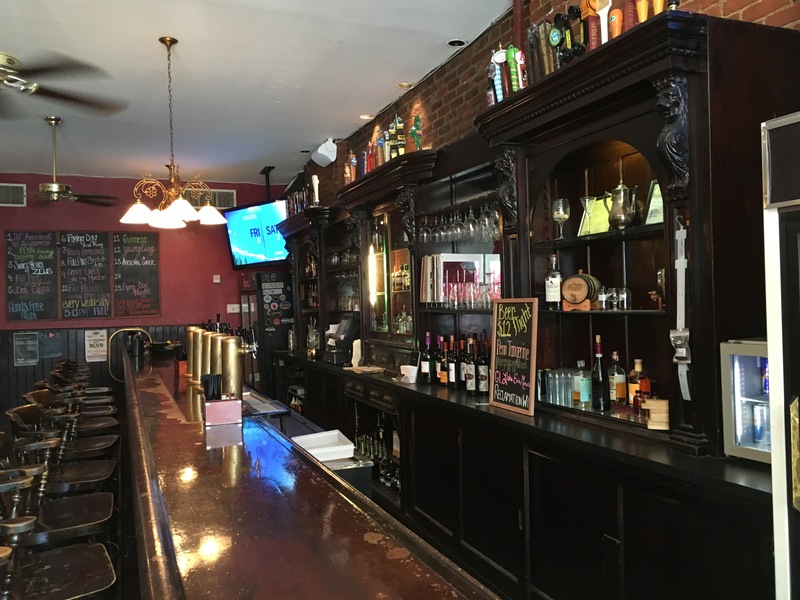 Craft beer still flows at the 80-year-old mahogany bar. The kitchen still turns out meatloaf with sweet cream corn sauce. But can James Street Gastropub and Speakeasy still be James street without live music? It’s hard to imagine, but that’s been the case since earlier this month, when Kevin Saftner, the pub’s general manager, was forced to shut down shows in the upstairs ballroom because of noise complaints. The pub, at 422 Foreland St. in the North Side, was warned, but a citation — it would be the second in less than a year — could mean a fine, a nuisance-bar designation or even closure, Mr. Saftner said. Here’s the problem. The building, which is approaching 140 years old, has no air conditioning, so the only way to cool the upstairs ballroom is to turn on fans and open up the windows … and that has led to complaints about the noise, Mr. Saftner said. The solution? Electrical work, air conditioning, sound proofing, all with a price tag that has yet to be determined and a fairly tight schedule before the losses associated with keeping the ballroom closed become too great. There are bright spots, however. A #SaveJamesStreet hashtag appeared not long after Mr. Saftner had to shut down shows in the middle of the Deutschtown Music Festival, one of the pub’s busiest days of the year. An Indiegogo campaign intended to raise $5,000 in the next month — enough to cover the costs of the initial electrical work — hit its mark in just over two days and is still rolling. And there are several promising fundraiser events coming up on the calendar. Shows continue in the smaller basement speakeasy and, of course, the restaurant and main bar are still in business. But even with those, Mr. Saftner said renovations to the ballroom must be completed by the beginning of September to keep losses to a manageable level. And in the meantime, he’s eyeing a more optimistic date: an Aug. 19 show, in the ballroom, with The Jauntee. If all goes well, he said. that’s when James Street will be complete again.